OK. She's in a wedding gown, he's in a tux. How did these lovely people get themselves into this situation? Well, it was all planned from the start-- the start of a foot race, that is. 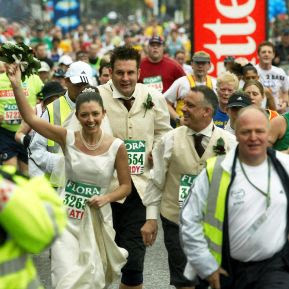 Yes, it turns out Katie Austin and Gordon Fryer tied the knot as they were halfway through the London Marathon. Wow.